Education has always been a cornerstone of Polonia. From the parochial schools of the Polish parishes, to the preparatory high schools of St. Francis in Athol Springs and St John Kanty in Erie, Pennsylvania to the highest educational institutions of Alliance College in Pennsylvania and SS. Cyril and Methodius Seminary in Orchard Lake, Michigan, Poles have always found a way to instruct their own. With hundreds of parochial schools that needed to be staffed, only one source was both connected to Polonia and educated enough to teach: the Felician Sisters. To ensure that the sisters were prepared to shape young minds and later to provide a quality education to the greater community, the Felicians established Villa Maria College. 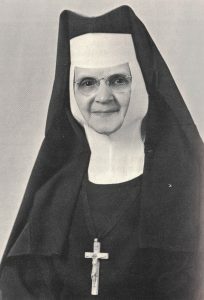 The impetus for a teaching college for the sisters by the sisters can be traced back to Provincial Superior Mother Mary Jerome Schnek. As early as 1907 the Provincial Superior organized summer preparatory classes that would lead to an undergraduate degree. The first attempt to create a full college for the sisters began the 1920s and was almost achieved in 1930, but ended up failing as the Great Depression set in. It would take 20 years and the vigor of Mother Mary Annette Guzowski to revitalize the project. Planning began in the late 1950s for what would become Villa Maria. Using available space at the Immaculate Heart of Mary Provincial campus, which already contained Villa Maria Academy, Mother Mary Annette struck an affiliation agreement with the Catholic University of America in Washington, D.C. and on June 5, 1960, Immaculate Heart Teacher Training School was born. The first 15 students to enroll in the new junior college were new postulates to the order. Soon after opening, it became apparent to the Felicians that a Catholic college near the Polish East Side would be needed as the baby boomers began graduating from high school. In June of 1961 they began working toward a college charter from the state of New York. On September 29, a five year provisional charter was granted under the name Villa Maria College. With everything in place, Mother Mary Annette announced plans for the multimillion dollar campus at the dinner of the Ladies Auxiliary and Men’s Aid Committee in December. Soon fundraising and construction were in full swing. Under the direction of banker Henry J. Osinski as the college advisory board chairman, architect Joseph E. Fronczak was hired to design the complex. It would take three years, but on November 29, 1964 the first part of the completed campus was dedicated. In 1968, the school was granted its absolute charter and became accredited with the Middle States Association of Colleges and Schools. In time the school transitioned from women-only to coeducational and at the turn of the millennium began offering bachelor degree programs. Since opening, the college has been a major asset to the Polish community. It maintains a collection of art that includes works by Joseph Mazur and Joseph Slawinski as well as a statue of Pope John Paul II near the auditorium. 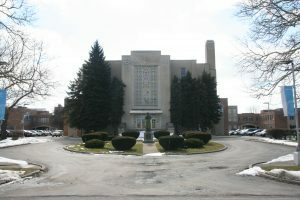 The college has also been the long-time home of the Polish Genealogical Society of New York State. Allen, Clare. "Villa Maria College." Buffalo Courier-Express [Buffalo, NY] 7 May 1967: 4-6. Print. "Pacts Let for New Villa Maria College." Buffalo Courier-Express [Buffalo, NY] 7 Apr. 1963: 1B. Print. Ryba, Ellen Marie. Response: Felician Sisters Centennial in America: 1874-1974. Ponca City, OK: Felician Sisters, 1974. Print. "Villa Maria College Dedicated." Buffalo Courier-Express [Buffalo, NY] 30 Nov. 1964: 9. Print. "Women's College To Be Established." Buffalo Courier-Express [Buffalo, NY] 12 Dec. 1961: 1+. Print.